There’s a long and fabulous history of both learning and fun in these games of resistance. Exhausted personally and politically by the current state of the world? Or just need a distraction — something to lighten up the remaining days of winter? Here’s a recommendation: Play board games! I’m not talking about Risk or Chutes & Ladders — even though they can be fun. I want to make a pitch for exploring the rather broad category of resistance-inspired gaming. There’s a long and fabulous history of both learning and fun in these games of resistance. Several started as educational tools to teach about political, social or economic realities. Others have been designed to offer practice at taking on and overcoming a problematic system. Ultimately, these games are a great way to inject some playfulness into a training or bring creativity into your strategic planning. Gameplay can be a low-risk (and less stressful) way to start planning for a new campaign or to exercise your team’s collective muscle without being browbeaten into it. 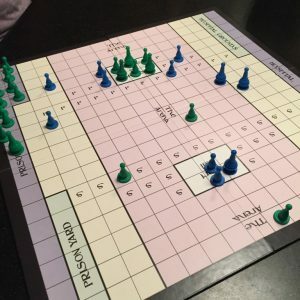 The following list of resistance games encompass a wide variety of styles — from cooperative to roleplaying to standard around-the-board gameplay. And each one has its own personality. Some will draw out your inner Gandhi, some will let you live your wildest fantasies of insurrection, and some will just make you laugh. So dive in and get your game on! The newest game, clocking in at just over a year old, is the fruit of the TESA games crew, otherwise known as the Toolbox for Education and Social Action. In Rise Up! Game of People & Power, all players are on the same team, running different parts of a movement struggling to beat “The System.” To start, pick an issue or focus story to work on: It could be something realistic like a government anti-corruption campaign, or something imaginary like “justice for baby dragons.” Everyone wins, or loses, together. The game develops tension as “The System” fights back when players draw a System card after each turn — delivering arrests, infighting, infiltration, surveillance and other impediments large and small. Do play this if you want to explore the trials and tribulations of organizers and activists working together on a campaign that you create. Coming up with your campaign (or focus story) together is a great entry point for non-organizers or new activists to immediately engage in the play. It is also a key way to address the big challenge of educational games: how to make them actually fun to play, as opposed to just a powerful training tool or exercise. Rise Up! runs well with five players, or can be played with a minimum of two (but that isn’t as much fun). Set aside an hour to an hour and a half. Young and old can strategize together, pondering whether it’s more important to add members or reach a new constituency, organize on the internet or work with media. Just watch out — you might end up in some real world arguments about the most effective tactical choices. Also, if you end up in jail, or the hospital, the game could end without you getting released. That’s why I’d recommend adding a rule that says winning is not possible unless everyone is home from the clink or the hospital. A big plus, however, is that the set includes two game boards, one for standard play and one that’s more simplified. Rise Up! gets extra points for its ethical production standards, having been produced almost entirely by worker cooperatives in the United States, with environmentally-friendly materials. Co-opoly, The Game of Cooperatives, follows in direct lineage from the seminal Monopoly, which was originally called The Landlord’s Game. Designed by Elizabeth Magie in 1902, The Landlord’s Game sought to teach about the dangers of massive accumulation of wealth by a few landowners — and present an alternative that kept the economic value of land and natural resources for the benefit of all. Similarly, Co-opoly turns the unique circumstances of starting and running a cooperative and democratic business into a fun and easy game to play. In Co-opoly, you win when you have accumulated enough resources to start another co-op. You lose if you can’t pay your bills or continue to run your business. Decisions about pay scales, investments, insurance coverage and price setting are all on the table. These decisions are made by the players together, as everyone is on the same team as part of the same co-op. More challenges are embedded in the game through mini charades, drawing contests and fun bits that bring out a wide spectrum of skills (or lack thereof, somewhat hilariously) in your fellow employees. 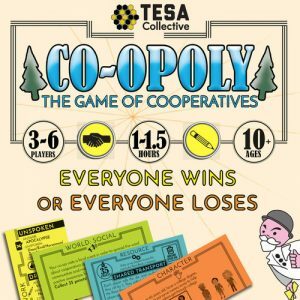 Play this game with three to six folks (the more the merrier), and cooperate to build up the co-op’s resources — since everyone wins or loses together. Allow at least an hour and a half to get all the way around the board once, and more if you are set on succeeding in starting a new co-op. Players are given model personas to frame their participation in the tasks and challenges presented, as they travel the path of cooperative business life. 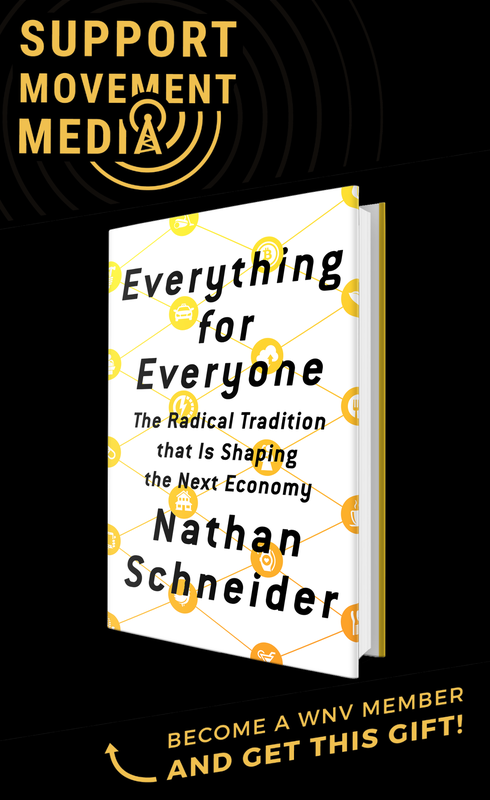 If members complete challenges then everyone benefits — a clear way to learn about issues of solidarity and democracy within a cooperative economy. Co-opoly also gets plenty of points for ethical production, with a majority of components produced by cooperatives and printed on recycled paper. 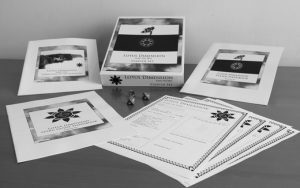 Lotus Dimension is a tabletop role-playing game, or RPG, that would be familiar to fans of other RPGs like Dungeons & Dragons. All RPGs are built on a foundation of storytelling and quests (problem-solving challenges) governed by elements of chance (often through the use of dice). Unlike the other RPGs, however, Lotus Dimension players must solve conflicts without using violence in order to be successful. It is worth noting, however, that the game acknowledges free will and therefore violent solutions can be chosen, but at a great cost to the players. D & D players have an adage, “If you can’t kill it, get creative.” In Lotus Dimension, you skip the first part and go right to thinking about what other solutions are possible — replacing violence and weaponry with empathy and ingenuity. In order to do well, players need to shift away from a combative mentality to open up alternative winning pathways. Players choose their own characters, which fall into several “eccentric modern day archetypes”: Artist, Monk, Illusionist, Journalist, Hacker, Mystic, Free-Runner or Shaman. Within the provided template, players build out their backstory, select resistance skills and tools, and identify notable personal traits. A “Guru Guide” creates and describes the world and the flow of the game for the Nobles. Outcomes of dangerous quests are determined by dice rolls and input from the Guru. Together, Nobles use the brainstorming of collaborative tactics — rooted in the principles of nonviolence and the Buddhist Noble Eightfold Path — to overcome obstacles, achieve objectives and defeat the “Dark Side.” All this must happen while trying to cause as little harm and suffering as possible. As with most RPGs, allow plenty of time to get into character and develop a comfort level with inventive storytelling in order to get the most out of Lotus Dimension. It is recommended for three to five players, age 12 and older, due to violence in some of the scenarios — though that would not be an issue for many kids today. Of all the games reviewed here, it is the one best suited to become an engrossing hobby for the right players, rather than a one-off evening adventure. Another plus: Lotus Dimension can be purchased online as downloadable PDFs. All you need is an eight-sided die to start playing right away. Where Lotus Dimension actively rewards nonviolent resistance and creative ingenuity, Bloc by Bloc is focused on gamifying “21st century urban insurrection.” Solidly rooted in the rote tactics of occupation, looting, blockading and fighting the police, players are to imagine themselves as part of a “vibrant popular rebellion struggling to liberate a city.” And imagine they must, since there is no discussion of what makes the rebellion either vibrant or popular. In order to win, you must meet the end game conditions — such as establishing a certain number of occupations in the city or defeating the authorities in the Blocs — by the eighth night, or round, of the game. If that doesn’t happen, the military steps in and crushes the remaining insurrection. 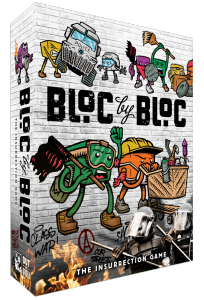 Bloc by Bloc has a few creative play elements that expands its shelf life and keeps things interesting. For example, every time you play you create a new and unique game board through a random generation of city bloc layouts. The game can also be run semi-cooperatively or fully cooperatively. Players can also have sectarian or nihilistic secret agendas with asymmetric abilities, thereby enabling them to leave their fellow insurrectionary factions in the dust. The guide contains 10 mini-expansion scenarios that offer variations on existing strategies — with titles like “Routine Traffic Stop,” “Let the Infighting Begin” and “Burn Down the Company Town.” If you are already someone experienced with uprisings, these scenarios could trigger your PTSD! The game board, cards and tokens are colorfully playful with cheerful graphics, somewhat contrasting with the game play content itself. There are a gazillion pieces of wood and hardboard tokens, along with eight plastic die to manage. 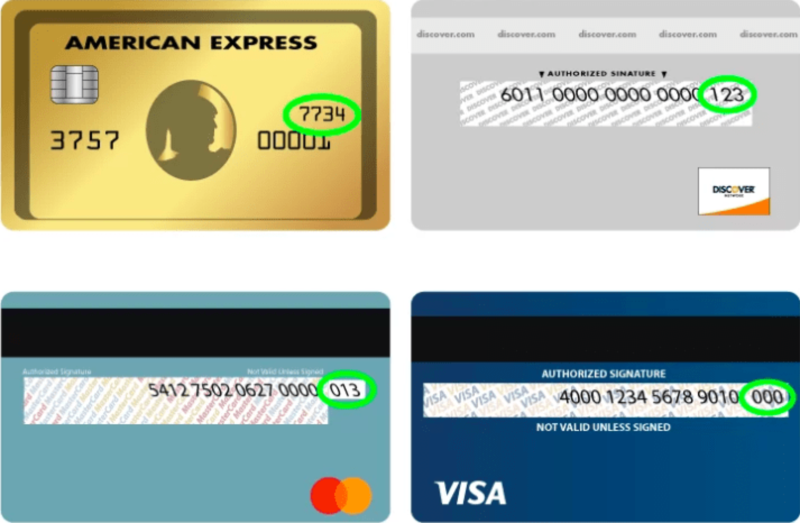 All are nice to look at, but challenging to manipulate. Then again, if you are interested in running an occupation, logistics and stuff management is a big part of that. The fact that this game exists outside of reality — in that there is no having to say sorry for destroying community resources or infrastructure, no one getting wounded or killed, no responsibilities attached to liberating a city bloc — certainly adds to the fun factor of fighting back with impunity. Even activists who are ardently opposed to property destruction might be able to suspend philosophical principles enough to get something out of playing the game. Likely, the simplistic logistical moves that drive most of the play will only serve to emphasize why strategic thinking adds up to more than simply deciding which barricade to place where or what store to burn down. In other words, Bloc by Bloc would not be your go-to-game to advocate “urban uprisings” as a winning strategy. 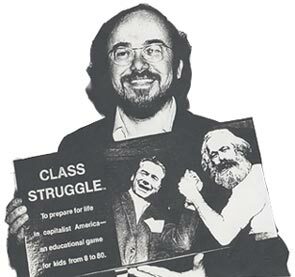 Class Struggle is a somewhat legendary example of the lineage of illustrious educational games. Being neither big on unique game process nor design, it is a fabulous specimen of how to use the simple rolling of dice to explain complex economic realities. New York University Politics Professor Bertell Ollmann created Class Struggle in 1978 to teach about the reality of capitalism according to Marxist theory. He also credits Magie’s Landlord’s Game with inspiration. From the game rules: “Class Struggle reflects the real struggle between the classes in our society. The object of the game is to win the revolution, alone or in alliance with other classes. Until then, classes — represented by different players — advance around the board, making and breaking alliances, and picking up strengths and weaknesses that determine the outcome of the elections and general strikes that occur along the way.” The game can be played with two to six players representing the classes (capitalists, workers, students, farmers, professionals, small businessmen). The goal is to accumulate as many assets as possible before the revolution arrives — since whoever has the most assets at that point wins. More than 100 years ago, Suffragetto was “The very latest craze! An original and interesting game of skill between suffragettes and policemen, for two players.” These two players enact the street battles between the radical suffragettes and police constables in Edwardian London. Recently re-discovered, Suffragetto was originally designed and produced by the Women’s Social and Political Union, or WSPU. The militant WSPU broke off from their more pacifist suffrage sisters who advocated working within the system. WSPU embraced confrontational tactics of street disruption and property destruction due to their frustration at what they considered the slow pace of change. It’s worth noting that outside the purview of this simple boardgame, some social movement scholars have argued that the decision to escalate with more violent tactics actually slowed the WSPU’s path to victory. In the game, the simple goal of the suffragettes is to break past the police lines and occupy the House of Commons while keeping the police from getting in to Albert Hall and shutting down their meeting. Conversely, the police are trying to break past the suffragette line and occupy the WSPU meeting space, while defending the House of Commons. The first group to get six of its markers into their opponents home base wins. Each side has 21 markers with both leadership and rank and file. Five larger markers represent the “police inspectors” or the suffragette leaders. The play is somewhat similar to a checkers game — with captured or “disabled” policemen sent to the hospital and captured or arrested suffragettes sent to prison (of course). In some ways, Suffragetto can be seen as a physical manifestation of the bigger crisis in British society around the role of women. The campaign to secure the vote opened up a conversation about women’s relationship to power and their use of public venues to exercise their rights. More militant leaders of the time openly embraced an ideology based on claiming equal civil and human rights for women and emphasized the importance of preparing oneself physically for this work — quite a bold stance at the time. When the WSPU’s escalated tactics were met with increased police repression and brutality, the WSPU responded by creating a 30-woman bodyguard corps for protection called the “Amazons.” Supporting athleticism and self-defense training for women as essential feminine knowledge was a radical move — and likely so was the production of a game that offered a way for women to practice and think strategically about activist conflict. Since the game is way out of print (there is only one known copy of the game in a museum in the United Kingdom) you can either download and print your own game or access the newly developed online version. Play this game if you want a historical taste of early suffrage struggles challenging gender norms through the flexing of feminist game-playing muscles! This is an intense historical game, set in the pivotal time of the Underground Railroad in the United States from the early 1800s to the Civil War. Produced by Academy Games, which is known for its attention to detail and high production value, Freedom is a beautifully presented collection of tokens, maps, historical cards and more. The game takes on the heavy subject of slavery by engaging players as abolitionists who work together supporting the Underground Railroad against the institution of slavery. 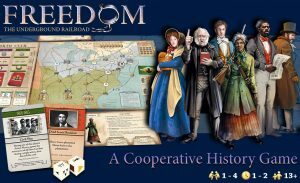 It has both easier and more difficult versions, both of which require the collaboration of the players to develop strategy and win, moving enslaved people to freedom. Play this game ready to tackle difficult content and make hard decisions. Losing people to the slave trade can be rough, but moving them to freedom can be incredibly uplifting and rewarding. Play this game also to remind yourself that slavery was once an institution that seemed intractable, but was ultimately defeated through the sincere and intense engagement of many people over time. In the game, players work to raise funds for the Underground Railroad and other abolitionist work, as well as to change the minds of Americans on the issue overall. It is recommended for one to four players, with about 90 minutes of playtime for ages 13 and above. It offers some of the best edu-tainment found in current games, balancing the historical facts and figures with intense action flow. Players need to figure out how to balance their work of moving enslaved people to freedom with raising the funds needed to keep the work going — all the while, slave catchers roam the board threatening to capture runaways and return them to plantations. With good focus and cooperative play, players could end slavery during their session. And that success is inspirational. Fantastic Nadine. Your posts add a much needed dimension to the struggle. Here’s an addition we have tried out here in Thailand. It is very comprehensive. Thanks Sam! I will admit that my interest in activist games was piqued by my work with BeautifulTrouble.org and BeautifulRising.org as we are engaged in developing what we call The Game-Not Game of BeautifulTrouble! We do encourage folks to download it ( for free in its very Beta Version) off the web site you mention– and use the cards based on the stories, principles, tactics and theories of BeautifulTrouble to play a version of Cards vs Humanity or Apples to Apples, or even just pull cards for inspiration on developing creative actions. The Not Game version focuses on developing a strategic plan, and there is a planning pyramid offered for that. We are continually looking for input and feedback as we develop The Game Not Game into a strategically useful– and hopefully fun– exercise! great job… yet you didn’t give them grades…or stars…..
Is there any website where these reside that might give them ratings? And I wonder if there are any board games in other languages? Here’s another article discussing socially conscious board games — not sure if you’re seen some of these? Oh– did not see this ( as it just came out!) 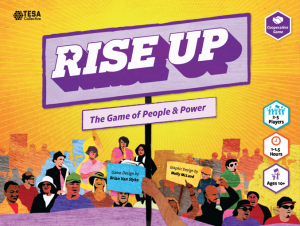 This is a most fabulous and comprehensive article on socially conscious board games that you have never heard about– from Bongopoly to Street Life: The Homeless Survival Game, and Harassment: You be the Judge to TRUMP: The Game!….. Thanks for sharing. Stephanie Van Hook of the Metta Center also wrote a nice piece on games that inspire us to solve social problems. 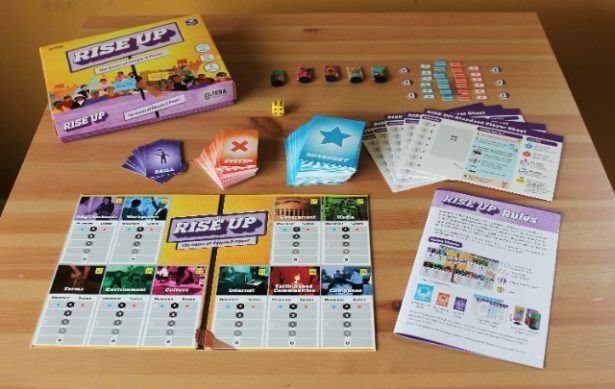 It too came out last week — so it was a big week for socially conscious board gaming! Beautiful ideas. These are all simulations to greater or lesser degree. Thank you, Nadine, for all you have done and continue to do. I suggest editing this post to talk about humans, not “slaves”. Losing humans or people to the slave trade, not losing “slaves”. Language matters. Thank you for this comment– we agree language matters, and have taken your advice and you will notice we have changed the wording to “enslaved people.” We did leave “slave catcher” as it is in order to keep with the wording of the game play. #BlackLivesMatter. This is a great compilation. For online games I would add molleindustria, who have been developing “radical games” for some years now. They are usually more focused on political infotainment but with very interesting design.